has unwisely decided to surf the Internets again. important document on teh city's website." 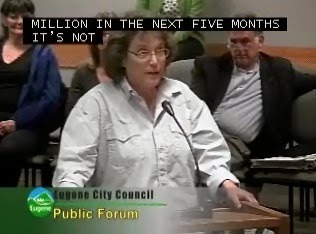 Dummy Deb Frisch harasses a City Council meeting April 14th. of teh cost of renovating teh Stadium..."
without having accessed teh page herself. in 2006, 2009, 2010, and 2011). Frisch's latest eruption adds to her string of recent episodes at public meetings. down Cheez Doodlez during her online forays.